← Ni’s Pattern Design 01: Digital Christmas Pattern Designs! 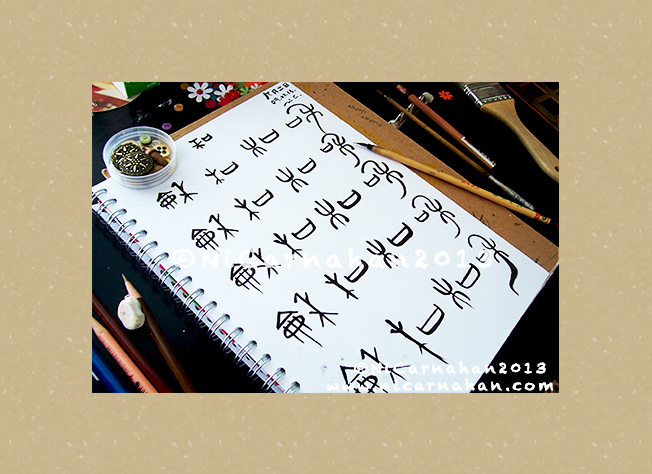 On Ni’s Table Today: Practicing Chinese Calligraphy 書法-和 harmonious/peace…. This is what’s On Ni’s Table Today- a variety of 和 harmonious/peace in both Chinese Oracle Bone Script and Chinese Bronze Inscription! I have been practicing my Chinese calligraphy 書法 skill everyday now. It really calm me down and prepare me for busy schedule ahead. I used to practice writing it in my school years back in Taiwan. At time, it was mainly homework for me,and I did not put much effort into practicing it. However, I am always fond of Chinese calligraphy書法 , Chinese literature 中國文學 and ink and wash painting 水墨畫. It will take years and years of studying and researching to know better of these three areas. Now, I have fallen in love with Chinese calligraphy all over again,and really want to get better at writing it. It will take a lifetime of being persisted to practice daily in order to master this unique art of Chinese treasure. My goal is not becoming a master of this art,rather enjoy the process of practicing and putting my handwritten calligraphy into my arts which I have been doing. Please go and see my Asian Button Girl 01 Faith to see my illustration with my handwritten script. So, here is what’s On Ni’s Table Today. According to Wikipedia-the free encyclopedia about Chinese calligraphy 書法, there is a general standardization of the various styles of calligraphy in this tradition. Chinese calligraphy and ink and wash painting are closely related, since they are accomplished using similar tools and techniques. Chinese painting and calligraphy distinguish themselves from other cultural arts because they emphasize motion and are charged with dynamic life. There are indeed many Chinese script styles, and each style has its own beauty and way to write it. I am fond of each style,and want to explore more whenever I can. After all, I am so happy to carry this tradition of my culture and combining it with my art. Please click on any word or phrase that you would like to learn on this post as I have linked them to Wikipedia for you to learn more about Chinese calligraphy. Also, click HERE to see various styles of Chinese calligraphy from google search. Please view more of my handwritten Chinese calligraphy here. Thank you!! Really beautiful calligraphy, Ni…I love that you are planning to incorporate this into your artwork, making your artwork even more unique. Thank you,Kimmie! ^________^ I actually combined my handwritten calligraphy with my Asian Button Girl Series. You can check out the previous post. I really like this technique and will explore more. Thank you again for your kind comment about my calligraphy.